We track the origins of the bothy bag (usual UK word) and Zdarsky sack (usual USA word) and also find some interesting cross relationships between bivi tent designs of the late 1890s, by Alfred Mummery, Zdarsky, (post WW2), Frank Smythe and Robert Burns (A Manchester UK gear manufacturer) who worked together in the 1930s.. 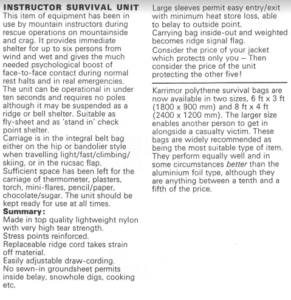 There is glancing reference to the Griff Pugh recommended polythene survival bag of the 1970s and the bivi bag which has come to mean an envelope covering a single person with or without sleeping bag. This piece of gear is something which didn’t become effective until breathable membranes/Gore-tex™ arrived in the late 70s, early 80s. This information will further evolve in our KDSW part 3, in the chapter ‘Layering for bivouacking’. 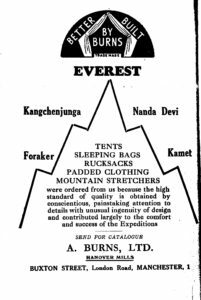 All these mountaineers were looking for similar levels of protection, flexibility and lightness, although the name varied from tent to bivouac according to the level of comfort provided. 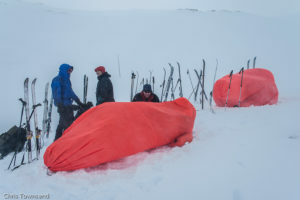 Link to a commercial range of bothy bags from 2-10 persons and larger MR (Mountain Rescue) versions for pulling around the rescue stretcher to give shelter for first aid to be supplied. Caption: Bruce and Mummery, with sirdar and tent en route for Nanga Parbat 1895, with permission of the Alpine Club Photo Library, London. Albert Frederick Mummery was a very prominent British alpinist in the late 19th century. He disappeared on Nanga Parbat in Aug 1895, on the first attempt by any mountaineer on an 8,000m summit. 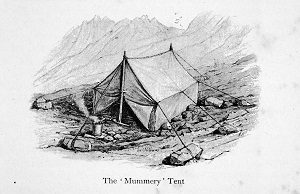 Looking at the innovative Mummery tent of the 1890s (which followed the Whymper tent of the 1870s), we can see the beginnings of a common concept, in that the users could sit inside and pull the fabric underneath them. This wasn’t possible with the Whymper tent of course because it included the first example of a sewn in waterproof groundsheet. This could serve three purposes: decreasing the size for stability, reducing wind/fabric flap noise, and providing something to sit on. 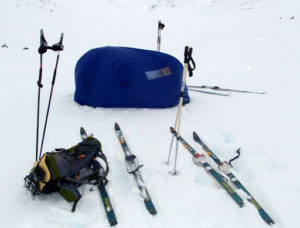 Ice axes could also be used as tent poles. This tent was produced commercially by Benjamin Edgington until as late as the 1950s. (Edgingtons were a UK plc and eventually the subject of a reverse takeover by Blacks, becoming Black and Edgington plc for a few years before further mergers. Blacks’ 160 year history is included on our website. This dates from the 1920s. Little is known of his original bag design but it’s referred to over a long period. There are many interpretations found on line, but the original appears to have been essentially a tube of fabric and not found to be practical. The interpretation of the original concept is shown here. Mathias Zdarsky name lives on, probably because of his fame and huge influence on alpine skiing. Arnold Lunn (a UK ski activist before and after the Second World War ) referred to him as the father of alpine skiing because of the prodigious amount of training he did for the army during First World War and his book publications on ski technique.For background of Zdarsky’s ski influence see Mathias Zdarsky the Father of Alpine Skiing. See below notes on development of Zdarksy sacks in USA. Smythe and Burns in the 1930s. Frank Smythe was a prominent British alpinist in the 1930s. Here is some additional information on how he developed his gear in conjunction with Robert Burns, a clothing, tent and pack manufacturer based in Manchester, UK. his products are associated with wild land access movement of the 1930s, using the words, “The man who made sleeping out safe for democracy”. “Burns showed that the ideas behind Smythe’s sleeping bag came directly from bivouacking on the Brenva face of Mont Blanc which made him think a lot about how to adapt and improve existing designs. He had ‘…a Zdarsky tent which was merely a large bag made from a sort of rubberised cambric, he tried this out on one occasion. The method of using it is to pull it over the head and sit inside supporting it with the body. One would no doubt coil the rope or line and sit on that, and endeavour to hold the tent off the body with the ice axe. However, it is impossible to keep it from touching all round and where ever it does touch the cold strikes through. Another disadvantage is that, being air proof it is necessary to lift it at frequent intervals to get air to breathe. 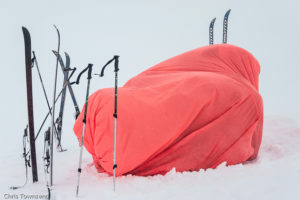 Finding its utility in its original form so very small he converted it into a cover for an ordinary down sleeping bag, and with this outfit he bivouacked under the Red Sentinel, when he made his wonderful ascent of the Brenva face of Mont Blanc. He spent a fairly comfortable night, although the bag was too tight and condensation formed inside the outer cover.’. paid off.Although Benjamin Edgington remained a significant suppliers of tents, sleeping bags and rucksacks, Burns cornered the market for some of the more specialist items. 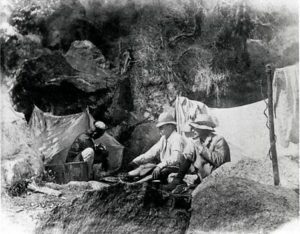 Three of his adapted Meade Tents with a triangular door were used, along with sleeping bags and lightweight rucksacks – some of which he supplied to the expedition gratis. He was nonetheless very doubtful about another tent taken by Jack Longland for emergencies. It incorporated the old Victorian weight-saving idea of substituting ice axes for poles and had an Arctic tunnel entrance. According to Burns it was awkward to erect and of course we know how the 1920s Everesters had hated tunnel entrances, but it was only meant as a last resort. Burns also supplied his newly designed high altitude tent – theYak, which had evolved from his 1933 experiments and been tested on Shipton’s 1935-6 Reconnaissance Expedition. The KISU, Karrimor Instructor Survival Unit aka a Group Shelter or Bothy Bag. The original weighed 1,070g, made from a light tent fabric, and was large enough for 6 people, plus instructor. This product was the precursor to many subsequent products bearing a variety of names, and sometimes claiming, erroneously, to be the first. 2 person bothy bags are now available at around 430g. They are used extensively by group leaders/instructors/guides throughout the UK, and Northern Europe, but surprisingly little in alpine areas. These products are now widely available but breadth of function is perhaps not fully understood. The original KISU had a large sleeve entrance at both ends and cords along top and bottom edges. 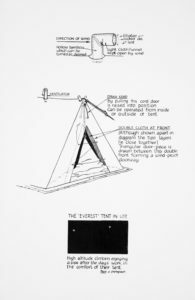 This created a size adjustability for the number of people by drawing the lower cord around and even underneath the occupants This also increased stability and resistance to wind. The upper cords allowed the KISU to be supported on skis at each end or between trees and the backbone cord along top at centre could be drawn up to shorten the effective length. Ken Ledward, who was employed as a full time tester and product developer at Karrimor Accrington UK from 1972–8, had a key influence in the development of truly featherweight gear in the 1970s. In 1972, taking a week out of the hills, and working in the factory for a week with a sewing machine technician, he produced two full sets of gear for himself and Mike Parsons for the following year’s KIMM (2 day Mountain Marathon) held at St Mary’s Loch in Scotland. Gear included tents, sleeping bags, jackets, overtrousers, breeches and packs. Mike’s weighed just 6½ lbs. Working on the principle that he was pint sized and older and so needed lighter gear, Ken’s was just 5½ lbs. “I had read about the so called Zdarsky Sack that was available to British Antarctic Survey staff in Antarctica. I found that it was trialled but not used and nicknamed ‘The Disaster Sack’, implying if you ever needed to use it it would have been a disastrous situation. This was a tube in essence and required time to get it fitted over the people and/or a sledge/pulk. As an Outward Bound Instructor I carried a flysheet during final scheme trips, when checking and locating student groups who were without instructors.The great thing about the flysheet was that it could be thrown over a small student group and held down by sitting on the bottom edges. This was not ideal and so I developed the KISU, intending for it to be a DIY piece of kit. (Karrimor manufactured and supplied it for several years from the mid 1970s, in parallel with their range of KIMM tents). I put a draw cord in a seam around the whole of the bottom edge and had a small sleeve entrance at each end; size was to accommodate a small group or family. In cold/wet weather a group could be out of the bad conditions and in face to face contact with each other instead of trying to slide down behind some boulder for a rest /snack. The psychological advantage in itself was a boost to a cold or weary group, and it added an amazing amount of warmth”. Almost every mountain rescue team and outdoor centre in UK bought the KISU and many retained their original. It could also be suspended from trees or skis/poles using the transverse top cord. A bothy bag being used as a lunch time stop for 4 people, in the Jotunheim Norway. Here are the original drawings and text from the Karrimor Tech Guide of 1974. Chuck Kukla (KDSW USA editor ) January 2019 on use of Zdarsky and bothy bags in east coast USA. When I started to learn about Winter Mountaineering in the 1960s and 70s, self-reliance was always the centrepiece of my mountaineering education. Today we are more likely to call for help on a cell phone, in essence placing the responsibility for ones safety on someone else. Today, though these are not standard equipment used by hikers. I sometimes look at gear lists and curriculums and this piece of gear is largely missing. In the class I now teach at REI, ‘Don’t Die in the Mountains’, the KISU and its variants are central and the idea is well received. In the 70s the Zdarsky Sack was standard equipment on all outings and I first used one in 1978. These were all DIY designs usually from 3 sheets of 4 foot wide ripstop nylon sewn together to make a tube. A draw cord was put on the ends to close off the two entrances. I think a break development came when we switched from round cord to flat core (or the other way around?) to make the closure easier. These were made big enough to hold 8-10 people. Any groups planning to go above tree-line was required to practice setting these up and staying in them a while. We strongly discouraged groups from taking a tent as we argued that a tent might be too comfortable and the idea was to use these at last resort. ADK (Adirondack Mountain Club) winter schools were established was because of the high number of accidents. One school in the Adirondack mountains in New York. The other in the White mountains in New Hampshire. Both were run between Xmas and new year. AMC_ADK Winter Mountaineering School. The AMC and the ADK are the two premier hiking and climbing organizations in the Northeast. The Zdarsky sack was hand-made (DIY) made by sewing 3 four 8 foot long sections of nylon together to form a long tube. The two openings could be closed with a sewn in drawcord at each end. This was required gear on all group outings at the school and was commonly carried on all winter trips sponsored by these two organizations. The Cairngorm accident in ’71 was one of the inspirations. It was felt that one of the reasons for the death of the 6 hikers was the isolation of each member of the group. 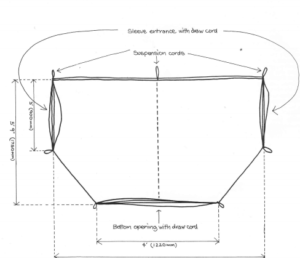 Zdarsky’s invention of the bivy sack could be made to hold a number of people, hence the name. Guy and Laura Waterman were homesteaders in Vermont, living on 28 acres of land in East Corinth VT. In the winter, they would park their car in a garage owned by a neighbor Roger Williams, a local chicken farmer. During one winter Roger received a brood of young chicks on one of the coldest weeks of winter and he was nervous if they would survive the week. To his surprise the young chicks huddled up together producing more than enough heat to survive. Hence what Guy and Laura would call the ‘chicken principle’. ‘Get everybody grouped together’. It seems that Laura sewed the first Zdarsky Sack in the late 70s. They liked the idea of making their own piece of kit and keeping the design as simple as possible. They also found that it was important to demonstrate the use in a realistic setting. It is hard to believe that a simple, thin piece of fabric could keep a whole group warm and that the social interaction of a group huddled together was essential for survival. In their many years of teaching they found that you cannot just explain in words that keeping warm and surviving is a social process as well. Karrimor original catalogues of the period and Tech Guides from the 1970s. Interview with of Ken Ledward 8 September 2000. © outdoorgearcoach – authors -Mike Parsons, Mary B Rose and Chuck Kukla. March 2019.